To extend my previous comments (here and here and here and here and here and here) about the Ukrainian crisis, let me point out some detail of the corruption that has led Ukraine and its military to this sad situation. Corruption would seem to be a social icon of Russian culture, not so much suppressed in the past but controlled and exploited for the needs of the tsar/party/state by often ruthless means, a symbiosis of government and crime that would awe Tammany Hall and Chicago. Our political corruption comes from mere gangsters; the Russian version comes directly from Genghis Khan. Russian culture extends through many of the former Soviet republics, through Ukraine and Belarus by way of a shared heritage, through the Central Asian republics through export and grafting. But there is corruption and then there is corruption. On the Russian side, the collapse of the Soviet empire saw the reins of power in the hands of the only functioning alliance that could be left, a combination of the nomenklatura that knew the pathways and connections of the government – the knowledge – and the Russian mafia who had the muscle. Corruption on the part of the Russians saw them consolidate the only real political goal worth having: power, and the means to expand and retain it. The Ukrainians have been no less corrupt, but they were cast by geography as a buffer between the slowly and cautiously expanding NATO to the west and Russia proper to the east, thus their corruption took on a different form. A buffer state has value only to the extent that the powers on either side see it as a benefit, protecting one side against the other. But if one side (Russia) sees no real threat from the other (NATO), then the buffer (Ukraine) loses its value as a tripwire for a threat of a much larger conflict. Ukraine becomes even more of an easy target when the form of its corruption derives from its inability to see that the three-way balance of power has changed. The internal consolidation of power, Russian-style, was interrupted by the 2004 Orange Revolution, but whichever party held sway (principally Yanukovych before and again after a five-year interregnum) were unencumbered by the responsibility of providing for an adequate defense, lacking (or so it would seem) a viable enemy. The military immediately became a source for looting funds in order to divert them to other, more lucrative uses, and it quickly withered to a state that was barely able to muster up a decent parade, this despite the fact that it still maintains an arms industry that produces only for export, because that is where the money is. 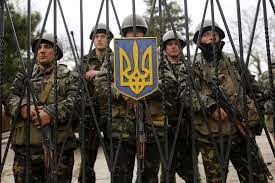 The woeful state of Ukraine's military can be blamed on corruption, Kiev's shaky commitment to national defense and a policy of selling the best weapons to gain cold hard cash…. [T]he leadership's neglect is backfiring. It could not stop Vladimir Putin's front-line troops from conquering Ukraine's Crimea region and, analysts predict, cannot prevent Mr Putin from annexing the Russian-speaking eastern region [Donbas] or from storming the capital…. Ousted Ukrainian President Viktor Yanukovych hollowed out the force to put money into internal security…. Since Ukraine's independence, …a succession of governments as a matter of policy decided that building a robust military to repel a Russian invasion was not a priority. The American obligation to support Ukraine does not find a mention in legally binding treaties or agreements, though some would argue a moral imperative nonetheless. Ukraine is not part of NATO (unlike Poland and the Baltic States [see notes]), but neither are we obligated under the 1994 Budapest Agreement, which is mentioned in confusing press accounts (not that I'm surprised by that). The agreement was forged principally as a means to assure Ukraine, then with the third largest stockpile of nuclear weapons after the collapse of the Soviet Union, that it could transfer (read "sell", as in Russia would buy it and we would pay to move it) its stockpile and divest itself of any nuclear weaponry, in exchange for an obligation on the part of the US, the UK, and Russia to seek the approval of the UN Security Council to respond in case Ukraine was a victim or object of aggression "in which nuclear weapons were used". We are under no obligation otherwise, and the part involving the UNSC renders it essentially neutered anyhow. Not only that, the agreement was never ratified in the Senate, so that is a moot point. But can we respond, actively or in part and in kind? We have no real ability to effectively back up our own troop commitments to Europe at the moment, much less anybody else's, either now or in the near future. As I mentioned before though, if we are in this for the long game, which would require political will which is grossly lacking in Washington, we could slip some elements of the US Army 10th Special Forces Group into western Ukraine to train up the traditionally effective Ukrainian partisans to prepare to take on the potential Russian invasion, but that would first require the Ukrainians to purge or control pro-Russian personnel and isolate the training in a secure area – no mean feat. The Ukrainians have a history of deadly effective partisan warfare, best known in World War II when different groups fought the Nazis and the Soviets (still an open sore on the body politic), and Special Forces, particularly the 10th Group, were created for this express purpose. You may remember that Special Forces did a rather admirable job in the early stages of the Afghan War in 2001 and 2002. (True, different war and different place but the lesson is learned nonetheless). A purge of this sort would have to include leaders, leaving those we can trust and the Ukrainian people can rally round as a way out of the corrupt morass they have been left with. That, of course, is up to the Ukrainians. Like I said, that is the long game, but we would provide some significant measure of support not just to the Ukrainians but to the world as to our commitment, and would establish a block to forestall Putin's future moves. It's a long shot, but it's likely the only shot we have.